, an eminent French writer and critic, secretary, and one of the forty members of the French academy, censor-royal, &c. was born at Beauvais, in December, 1670. After some elementary education at home, he came to Paris in 1686, and pursuing his studies, took his bachelor’s degree in divinity in 1691. One of his uncles, a canon of the cathedral of Beauvais, being attacked by a dangerous illness, resigned his canonry to him in 1695, but on his recovery chose to revoke his resignation. The nephew appears to have felt this and other disappointments in his view of promotion so keenly, as to determine to change his profession. He accordingly left Beauvais in the last-mentioned year, returned to Paris, and soon was distinguished as a man of abilities. The same year he acquired a situation in the office for foreign affairs, and became patronized by M. de Torcy, by whose means he accompanied the French plenipotentiaries to Ryswick, in 1696, where peace was concluded. 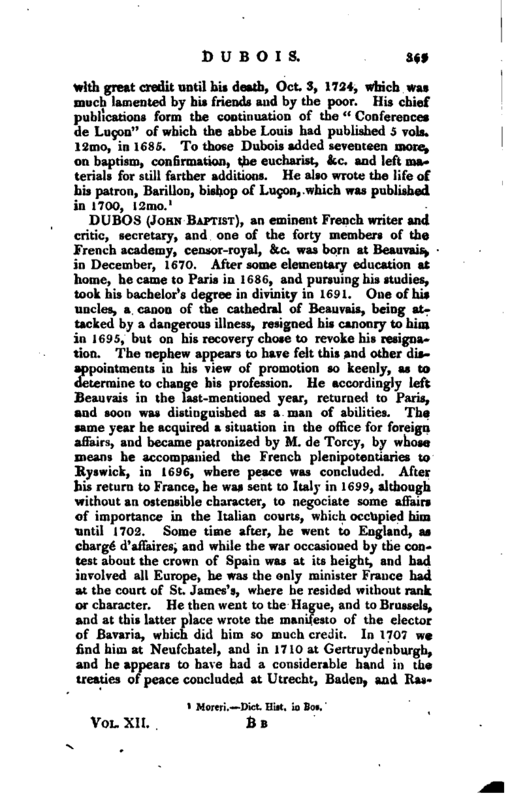 After his return to France, he was sent to Italy in 1699, although without an ostensible character, to negociate some affairs of importance in the Italian courts, which occupied him until 1702. Some time after, he went to England, as charge d’affaires, and while the war occasioned by the contest about the crown of Spain was at its height, and had involved all Europe, he was the only minister France had at the court of St. James’s, where he resided without rank or character. He then went to the Hague, and to Brussels, and at this latter place wrote the manifesto of the elector of Bavaria, which did him so much credit. In 1707 we find him at Neufchatel, and in 1710 at Gertruydenburgh, and he appears to have had a considerable hand in the treaties of peace concluded at Utrecht, Baden, and | Rastadt. All these services were recompensed in 1705, by the priory of Veneroles, and in 1714 by a canonry of the church of Beauvais. Having been employed in other state affairs by the regent and by cardinal Dubois, he was rewarded in 1716 by a pension of 2000 livres, and in 1723 was promoted to the abbey of Notre-Dame de Ressons, near Beauvais. 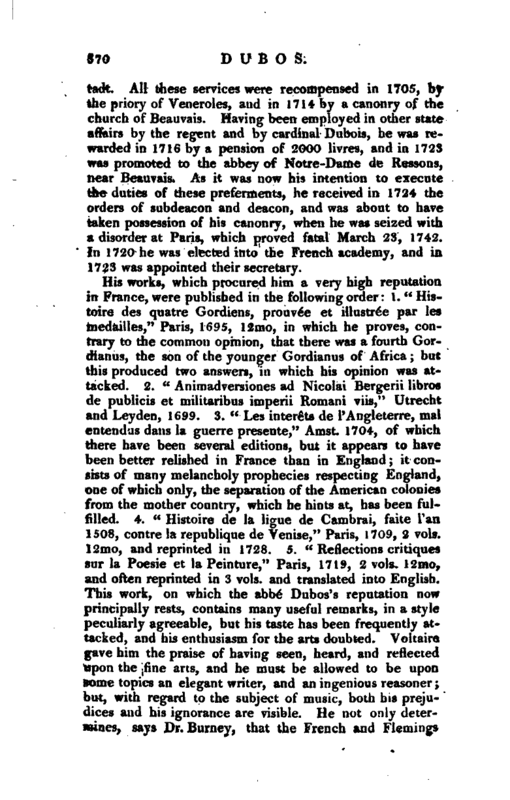 As it was now his intention to execute the duties of these preferments, he received in 1724 the orders of subdeacon and deacon, and was about to have taken possession of his canonry, when he was seized with a disorder at Paris, which proved fatal March 23, 1742. In 1720 he was elected into the French academy, and in 1723 was appointed their secretary. Moreri. 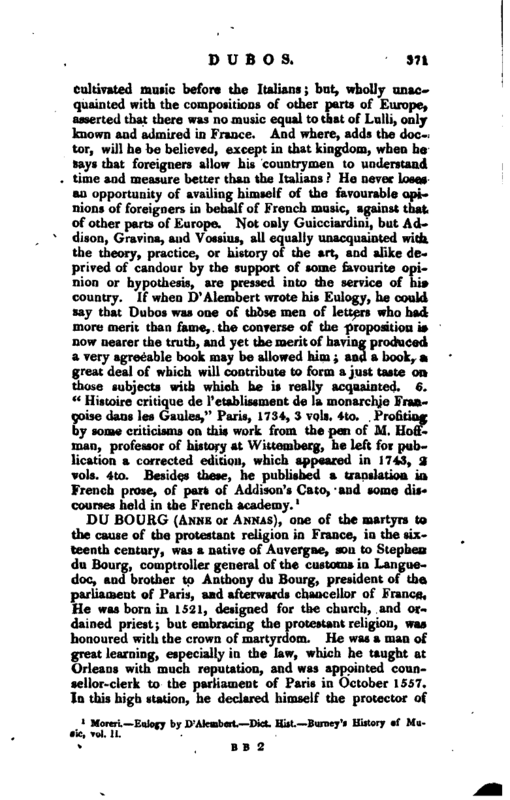 Eulogy by D’Alembert. —Dict. Hist. Barney’s History f Music, vol. II.